Strengthening its position as a leader in the delivery of video assistant referee technology, EVS’ (stand B90) Xeebra system has been selected as the exclusive video assistant referee (VAR) system by Spanish football’s top division, LaLiga Santander. Use of the tool kicked off ahead of the 2018/2019 season, where it already proved to be useful in the Supercopa de España between Sevilla FC and FC Barcelona in Tanger. 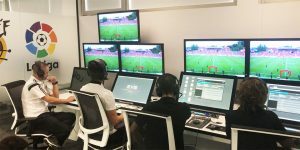 LaLiga’s VAR project has been driven by the league and the Spanish football authority, Real Federación Española de Fútbol (RFEF). Twenty Xeebra systems have been installed into a central officiating hub in RFEF’s Ciudad del Fútbol headquarters in Las Rozas, Madrid. Here, eight video operation rooms (VOR) have been built, connected through fibre to the 20 stadiums around Spain in which LaLiga games are played. For each match, a video assistant referee inside the hub assists the on-field officials, supported by an assistant and replay operator. Each Xeebra system is powered by an EVS PM-X server and provides the VAR operators access to up to 22 HD angles and five super motion camera feeds at three- or four-times speed. All video operation rooms are equipped with Xeebra’s touchscreen, which can be used for swift camera selection or to get a closer look at replays with its pinch-and-zoom feature. Operators can also use the BEPlay controllers to cycle back through all live camera feeds. For LaLiga’s VAR project, the latest version of the system — Xeebra 2.0 — has been deployed. It features a built-in AI offside line functionality that can be used for image-driven pitch calibration. Using this functionality, LaLiga’s VAR operators can add a straight and completely accurate offside line. This allows them to review player positions with the knowledge that the graphic’s position is one-hundred percent correct, thanks to the AI-enabled precision. The implementation of VAR operations for the league was approved by the International Football Association Board (IFAB), which governs officiating across professional football. Following this, MEDIAPRO was selected as the technology and service provider for the project. It performs the same role for major VAR deployments in Portugal, Mexico, and the UAE, as well as being the official VAR service supplier for the Confederación Sudamericana de Fútbol (CONMEBOL). Since its launch just two years ago, the Xeebra system has become a significant player as a video referee tool and has been selected by major sports federations for events around the world. It made its debut at Super Bowl 50 and has since been used as a football VAR in the Ekstraklasa, K-League, and Primeira Liga. It’s also been used as a rugby TMO tool during the 2017 British and Irish Lions tour to New Zealand and the NatWest 6 Nations. This year the UCI has integrated the system into a dedicated truck which has been rolled out for both the Tour de France and Giro d’Italia, while the British Horseracing Authority uses it as a race day officiating system throughout its busy calendar. The latest version of Xeebra will be on display at IBC2018.